Today is City Daily Photo's Monthly Theme Day and the theme is glass. 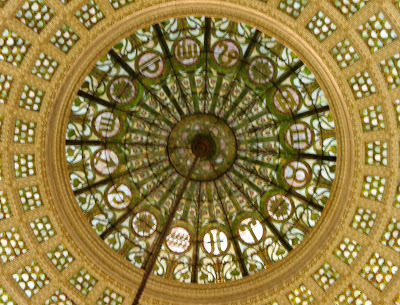 Chicago Cultural Center is the largest in the world. about 30,000 pieces of glass. It was completely restored in 2008. Although it was just a narrow view, there was a lot of color packed into this sunset. 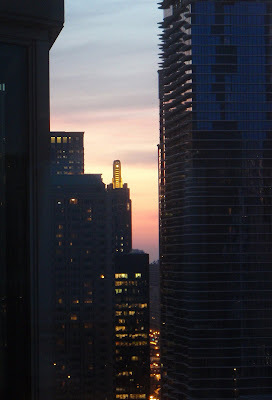 The building with the gold spire is the Carbide and Carbon Building. Chicago legend has it that the green, black and gold Carbide and Carbon Building was designed to resemble a bubbling champagne bottle. 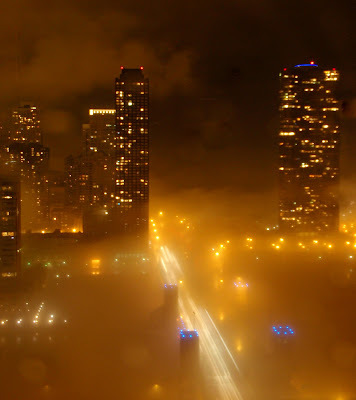 Lots of rain and wind in Chicago last night. 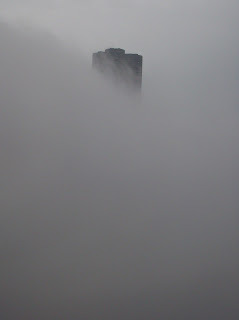 during the day when the fog made all the other buildings disappear.  We had a hint of Spring yesterday. 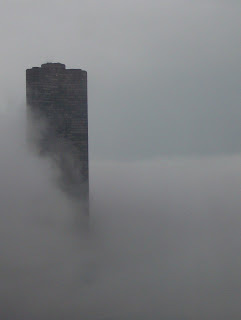 as they clip-clopped along Randolph Street. I took this photo through the windshield (I didn't think it would be a good idea to stand in the middle of the street to take a picture). I think that is why it looks darker and grittier than in "real" life. The title is "A Full Life Turns Mistakes into Miracles". I couldn't find anything on the artist, though. 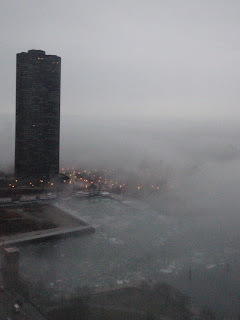 Chicago had a little more winter this past weekend. where I had gone for the Winter Green City Market. 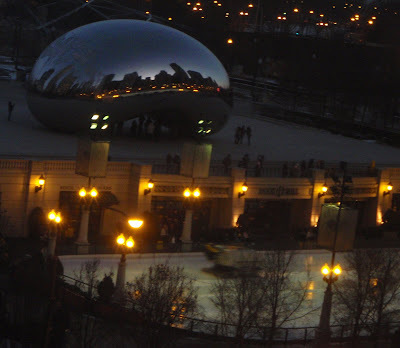 I was able to see Cloudgate at sunset on Friday. Not a view I often see. We were in the Cultural Center for a lecture from a very interesting "sustainability humorist" named Doug Fine. Before the lecture started, I was looking out the window and took this view. Cubs tickets go on sale today. Always a sign that Spring is on the way. (Of course, there was that time that the Cubs' Home Opener was called due to snow, but that's beside the point.) This picture is for all of us poor Cubs Fans who sit in the Chicago Cubs Virtual Waiting Room all day, always stay through the last inning, always throw the ball back, and always wait 'til next year. 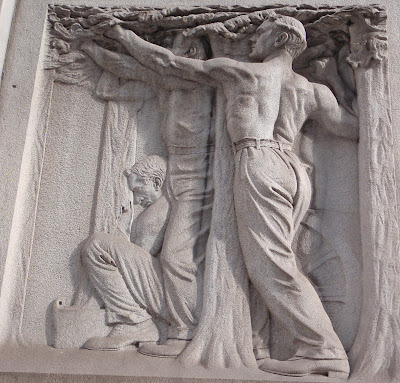 Today I'm posting the third of the four relief carvings on City Hall. The four relief carvings by the entrance to City Hall "represent ... four principle concerns of city government: playgrounds, schools, parks, and water supply". This one focuses on Parks. The figures in the carving seem to be planting trees and, perhaps, pruning the branches. This is a 17 foot tall bronze statue near Michigan Avenue and Congress. 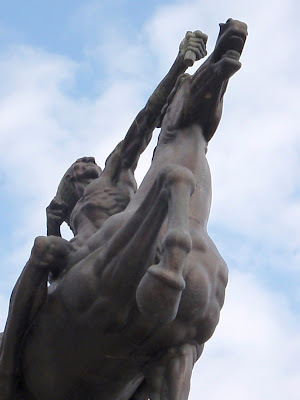 It is called The Bowman and was the work of a sculptor named Ivan Mestrovic. When looking up information about this piece, I found out that the archery bow is intentionally missing. The artist meant for the viewers to imagine the weapon. 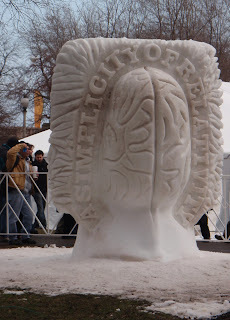 Two more pictures from Snow Days Chicago. 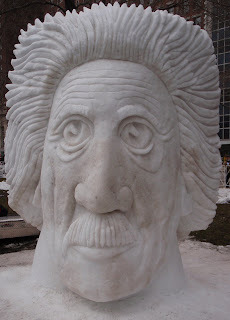 This is Albert Einstein by a snow sculpting trio from Sycamore, Illinois. 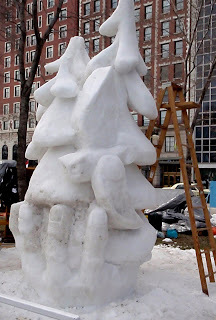 These pictures are of a sculpture called Palm Trees by "Team Michigan". The far left one is from Friday. The nearer one is from Saturday. I like swooping owl and the pun in the name. 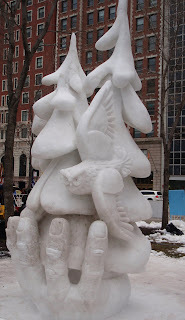 I have a few more snow sculpture pictures I'll post over the next few days. 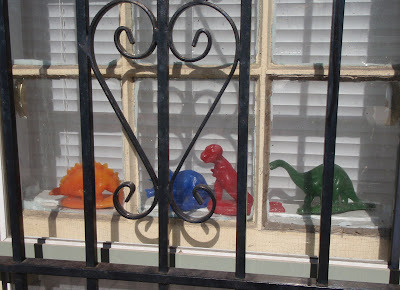 I didn't set out looking for a Valentine themed photo for today. I stumbled upon this one, though. 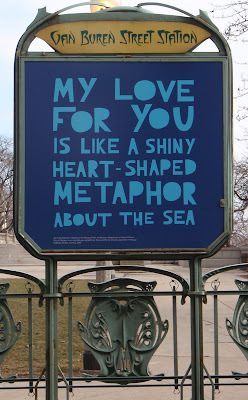 While looking up more information about it, I learned that it is the Van Buren Metra Station, where this Stephanie Brooks art quote is located, that is the actual art structure. It is a replica of a Parisian rail station designed by Hector Guimard. 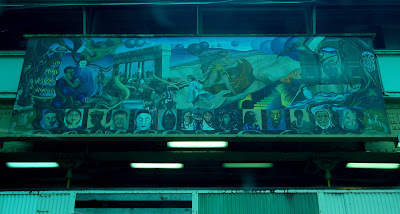 I'll have to go back and get a picture of the whole station to share here. 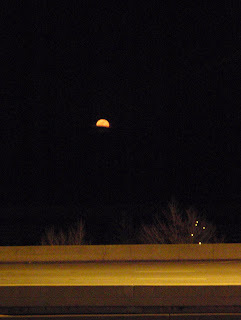 Four photos of the February Full Moon (also know as the Snow Moon). 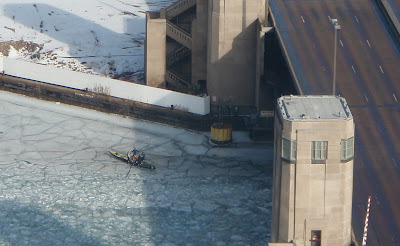 It isn't often you see five people standing around a canoe on the Chicago River. Not "by the Chicago River" or "near the Chicago River" but "on the Chicago River". So I haven't a clue what this scene was all about. It didn't really look like a racing scull and, if it was, why was it on the ice -- the river hadn't thawed enough yet. I also don't know how they got on the ice or where they went. I thought it was interesting that this cement truck had the Friends of the Chicago River logo on it. The cement mixer part was turning so one side was right side up for my view and the other side was upside down. 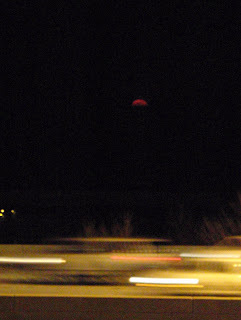 By the time I thought to take a picture and got out my camera, the upside down side was facing me. And the turning light for the lane the truck was in was green. 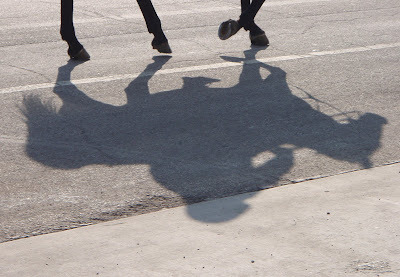 I figured: Snap this picture now, and just flip the photo for the blog. 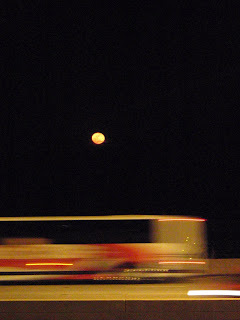 I took the picture just as the truck started to pull away. Doing the math, though, if the organization was established in 1979 (as it says), then its 25 year anniversary was in 2004 and this year will be its 30th anniversary. 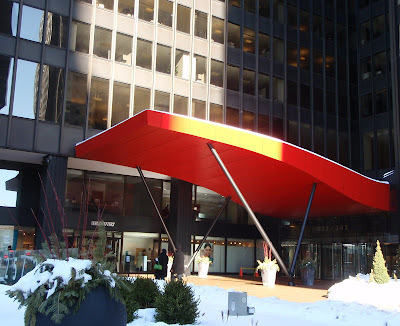 Last year, for reasons not entirely clear, the owners of the Illinois Center complex of office buildings added a bright red canopy to the main entrance. According to a blogger about Chicago Architecture, it was meant to liven up the "dark and sober" design of the black boxy office buildings. While it does add a splash of color to the landscape, I can't help thinking that the designer is a fan of the Rolling Stones and was inspired by their logo. Today is National Wear Red Day. Take care of your heart! OK, if you live (or lived) in Chicago, you know that Rush Street doesn't run along the "coast" or even the beach. 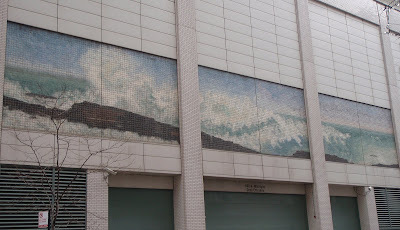 But, here on the Rush Street side of the 600 North Michigan building is a very large, three panel mosaic of the crashing surf. 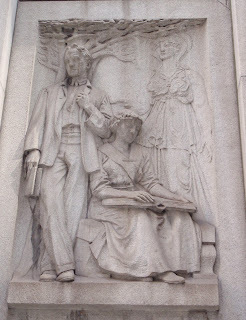 Last week, I posted a photo of one of four relief carvings on City Hall. 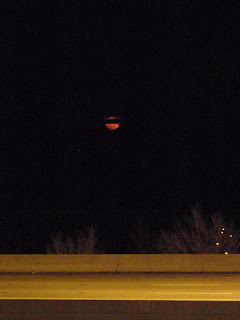 I went back and got the pictures of the other three. I'll be posting them periodically. The four relief carvings by the entrance to City Hall "represent ... four principle concerns of city government: playgrounds, schools, parks, and water supply". This one focuses on Schools. Like the Water Supply relief, this carving is very detailed. I interpret this as the student reading a book under a tree with her teachers making sure she keeps up her studies. 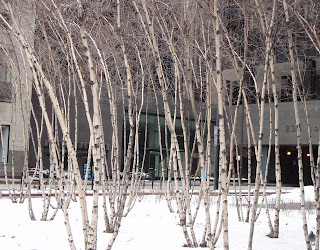 This grouping of trees reminded me of a painting by an artist who's name I can't recall. She did a painting of birch trees and "hid" an appaloosa horse in the spots of the birch trees. I thought of that painting when I saw these. After I downloaded the picture and was setting it up for publishing, I noticed that there was a bit of wildlife that is camouflaged within the trees. A pigeon, at the bottom right, snuck into my picture. Note: Thank you to Sharon of Phoenix Daily Photo who knew I was referring to the artist Bev Doolittle! The swirl in the clouds caught my eye. and the sunset was creating a pink hint along the horizon. going up now. The key word there being "AVERAGE". to start seeing colors creep back after so much white and gray. Today is THEME DAY. I've never participated before because (1) there was only one theme day I could have participated in since I started this blog and (2) I didn't know the registration process. CityDailyPhoto has made the registration process easier so here is my first Theme Day picture. 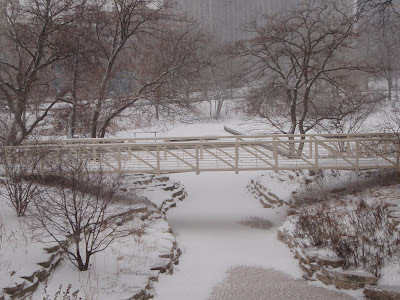 February's Theme is Paths and Passages. I selected this photo because it has so many paths and passages in it. There are the obvious streets, in this case Wells and Wacker, which allow passage through the city. 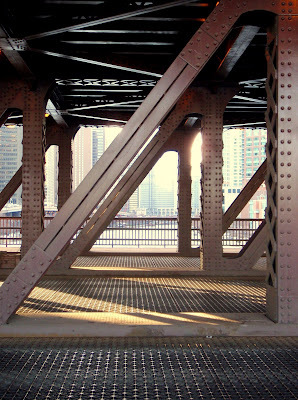 There is also the bridge, which allows passage over the Chicago River. The bridge has a sidewalk, providing people a safe path across the bridge without worrying about getting in the way of the vehicles. 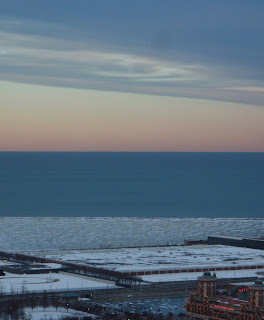 The Chicago River is the path between Lake Michigan and the Mississippi River (via the Sanitary and Ship Canal, DesPlaines River, and Illinois River). Lastly, there is Lower Wacker Drive, the secret speedy path under the city for intrepid and impatient drivers.